Brand New! Factory Sealed! He knew you were gonna buy this! ~ COMIC JUNGLE ~ $4.00 S&H in the USA will combine shipping with multiple purchases. Disc is like new, cover is excellent and stored in a protective sleeve. 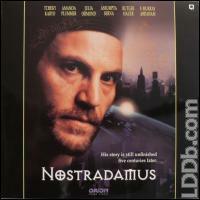 NOSTRADAMUS, US RELEASE APRIL 19 1995.FULLSCREEN. DISC w/FEW HAIRLINES,CLEAN/CLEAR.JACKET w/BLOWN OUT BOTTOM SEAM TEAR.MINOR BOTTOM CORNER WEAR. NO CORNER JAMS,CREASING,OR OTHER SEAM TEARS NOTED. BAR CODE ADDED ON FRONT COVER. Creasing on front. Sticker on front from video mart. Lots of wear on jacket but complete. Disc is in decent shape.